The world is full of colors. Your vehicle is no exception. Today’s vehicles have very complex colors that can sometimes be very difficult to match. Here at Express Collision Center we use a color spectrometer camera to assist us with locating the correct formula to re-create your beautiful color. 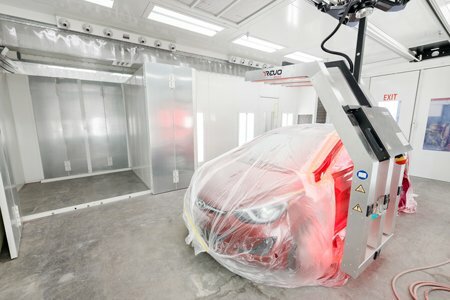 At Express Collision Center, our technicians are very knowledgeable when it comes to matching auto paint and applying it to make your car’s paint finish look as new as ever. We believe strongly in your rights as a consumer to get repairs for your auto paint how you want it, not how the insurance companies want. We are a family owned and operated business at 5450 Desert Point Dr., Las Vegas, NV 89118, and we aren’t going anywhere any time soon. We use only DuPont refinishing products, not some cheap generic brand. This allows us to warranty the refinishing of your vehicle for its lifetime against defects. This is a better paint warranty than when you bought your car brand new. Give Express Collision Center a call at (702) 676-2010, or just bring your car down to us to learn how we can help give your car new life!